I’ve been a potter for 6 years now (8 if you count my 2 years in art school, learning) and while it can be very challenging at times, it is the most rewarding undertaking I’ve ever immersed myself in. Clay is an exceptional teacher. 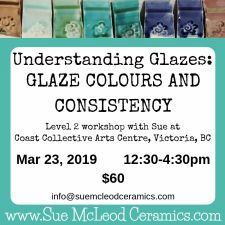 While I was learning how to make forms on the potter’s wheel, or how to fire my kiln to a perfectly hot cone 6, I was also simultaneously learning some valuable virtues of living a balanced and harmonious life. Patience – You can’t rush the clay. If it’s not ready for the next step, you have to wait. You can’t rush the kiln. Most firings take a couple days to heat and then cool. Pottery is not a craft where you can sit down and make something one day and it’s done. Most pieces take a minimum of 2 weeks start to finish. My working cycle is more like 4-6 weeks. Courage – It takes courage to put yourself out there as an artist. Not everyone is going to like what you do, and that’s ok. But it takes guts to sit for days in a booth full of your artwork, surrounded by pots that you’ve put your heart and soul into, your blood, sweat and tears, and hear people say “Ew, I don’t those colours” or “This is ok, but So-and-so’s are way nicer ” or “$30 for a mug?! I could get 6 just like it at (insert any box store here) for that price” or “I took a pottery class once when I was 8, it’s not that hard” or “You know what you SHOULD do? Change the shape, change the colour, change the size, change the style, change the price, THEN I would buy it.” People don’t mean to hurt your feelings, but sometimes they do. Remember, their comments have nothing to do with you or your work, and everything to do with what’s going on inside their heads. Try not to take it personally, hold your ground, stick to your guns and for goodness sake, don’t change what you’re doing because someone says they don’t like it. You are not doing it for them, you’re doing it for you. Letting Go – The first step is to let go of your expectations. Sometimes (oftentimes) things don’t work out the way you expect them to. 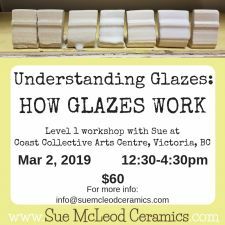 They crack, they slump, they break, they bloat, they warp, the colours come out wrong, the kiln over-fires, the kiln under-fires, the lid gets stuck, the lid doesn’t fit, the handle isn’t balanced, the spout dribbles. Some things you can fix, most you can’t. You just have to let them go and start again. The hammer is your friend. You don’t hold on to your failures, you learn from them and then you let them go. Persistence – When you have a vision for a piece and you make it for the first time, it might not be quite what you had in mind. It might be way off. It might be downright horrible. But you make it again. And again. Eventually you will get it. When you try something enough times, you will always, eventually, get it. Commitment – You can’t be a potter without serious commitment. Even when you’re just starting out and taking classes, you have to commit to the practice. It takes time and patience to get from making pots that look like a 5 year old could have made them (and you should be proud of these ones!) to making pots that make your friends say “wow, you really made that? !” There are so many different steps and techniques to first learn and then master, that you can’t even come close without a real, earnest commitment. And if you get to the point where you want to have your own pottery studio, the amount of space and equipment it takes to process your own work requires you to really go “all-in” with your relationship to the craft. This ain’t no one-night-stand, it is a long term, loving commitment. Determination – If you try hard enough and put yourself out there enough times, you will be rejected by shops, galleries, promoters, customers, contests and competitions. It takes a lot of determination to keep going when it feels like nobody gets what you’re doing. Don’t give up. Mindfulness – If you want to learn about living in the moment, try throwing a pot on the potter’s wheel. The slightest distraction and you are at the mercy of the laws of gravity and centrifugal force. Throwing a pot requires a deep connection between your mind, your body and the clay. You are continually responding to the clay, feeling it’s subtle movements with your fingertips, breathing life into your pot. If you want to take this mindful practice to another level, you can even close your eyes and throw the entire pot using only your sense of touch. The idea here is that you are paying full attention to what you are doing in that moment. Your senses are activated. You are not telling stories to yourself in your mind, you are fully present to the pot. The only story is what is happening in front of you. It can be a truly enlightening experience. Adaptability – As a potter, you really learn to go with the flow. Your schedule becomes flexible when your bowls aren’t dry enough to trim yet or your handles dry out and you have to make new ones. You start with the intention of throwing a bowl and it becomes a plate. Materials can be discontinued and you are forced to come up with a new glaze recipe. Your favourite trimming tool breaks so you Macgyver a replacement out of an old hacksaw blade. You just go with it, you adapt. It is a natural part of the process. 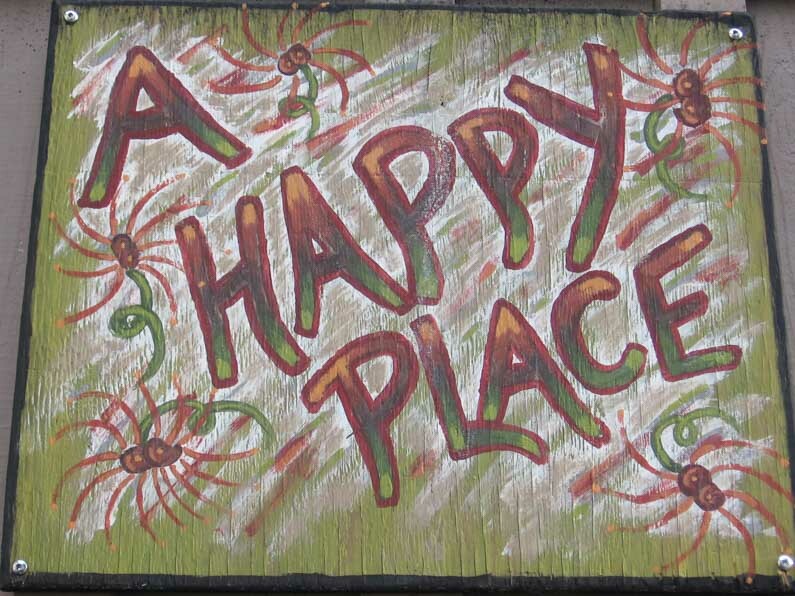 Community – The pottery community is like no other. It is the most sharing, helpful, supportive group of folks I could ever have imagined. Because ceramics is such a vast topic of exploration, it literally takes a lifetime of learning to become an expert. And most experts will tell you there is still so much to learn. No one person will ever know everything there is to know about ceramics. I think it’s because of this that potters are so willing to share their knowledge with each other. We can all sympathize with the same struggles and we congratulate each other on our successes. We remember what it was like to be just starting out and most are more than willing to help beginners along the start of their journey. 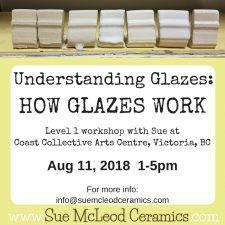 We share glaze recipes, decorating and firing techniques, innovative tool ideas and stories of our frustrations and triumphs. We have silly words for things and jargon that would make the layperson chuckle. It is a wonderful world to be a part of. So there you have it. My top 10 list of virtues that are cultivated with a pottery life. Can you add to this list? What are your favourite side effects to being a potter or any other kind of artist. What are you learning along the way? What other transferable skills have you developed as a result of working with clay? Please share your experiences in the comments below. I can’t wait to hear them.